LANSING, Mich. — Gov. Rick Snyder has signed Sen. Dale Zorn’s legislation as part of a multi-bill package to repeal dozens of obsolete, burdensome or duplicative state reports. Zorn sponsored Senate Bill 1007, now Public Act 293 of 2018, to repeal a requirement that the Department of Agriculture and Rural Development report on food establishment licenses issued by the department during the preceding fiscal year. The reports take many hours to compile, and the department said that it had not received any inquiries or questions regarding them in years. SB 1000 was the most comprehensive bill in the package. It repealed 16 reporting requirements in the Natural Resources and Environmental Protection Act. One of the eliminated reports is one by the Department of Natural Resources on the Recreation Bond Fund, which has been closed out and has exhausted its funds. The Senate and House measures are now PAs 237 and 287-310 of 2018. LANSING, Mich. — The first state trooper to be killed in the line of duty in Lenawee County will be permanently honored with a memorial highway after Gov. Rick Snyder on Tuesday signed Sen. Dale Zorn’s legislation to honor Michigan State Police Trooper Calvin Jones. Jones was killed on Feb. 10, 1956 when his patrol car crashed during a pursuit on M-52 south of Adrian. 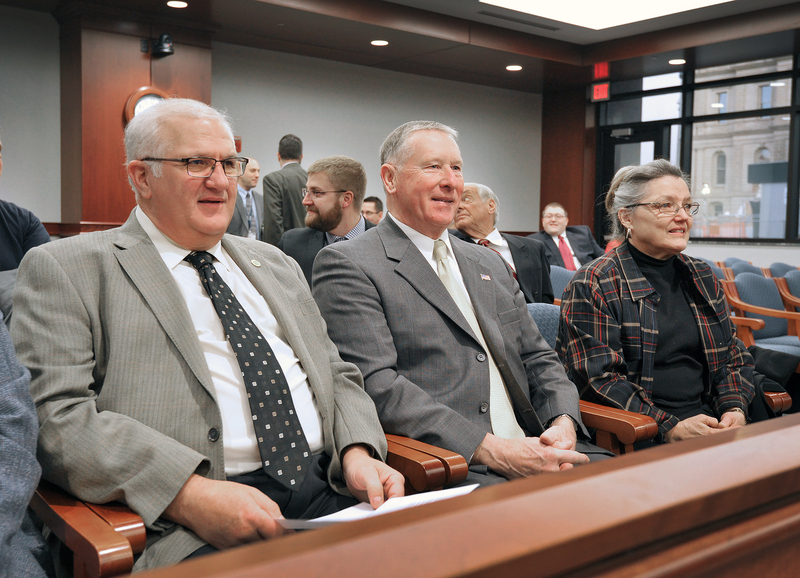 Jones’ daughter, Patricia Rowley, and her husband Claude Rowley attended a Senate Transportation Committee meeting in February in support of Zorn’s bill, which received unanimous support in both the House and Senate. Lenawee County Commissioner Jim Driskill knew Trooper Jones, who was a close friend of his father, and testified in support of the measure. “I am thankful that Trooper Jones’ daughter and many of those who knew him will be able to see him receive this long-overdue recognition, so that his life and sacrifice are never forgotten,” Zorn said. The memorial highway will have no fiscal impact on the state or local government. State law requires sufficient private contributions to completely cover the cost of erecting and maintaining markers indicating the name of a memorial highway. LANSING, Mich. — Gov. Rick Snyder on Wednesday signed Sen. Dale Zorn’s legislation as part of a bipartisan effort to modernize many of the state’s laws governing county registers of deeds. Zorn sponsored three of the 10 bills. Senate Bills 731-740, now Public Acts 191-200 of 2018, clarify and codify current register of deeds practices and the use of technology when recording documents. The new laws include improving the use of electronic systems in the recording process, providing a uniform method for handling sensitive personal information and ensuring the accurate translation of property documents from across the world. Michigan children deserve to have safe schools where they can learn the skills they need to succeed and be productive citizens, and the state Senate recently approved my legislation to help keep students safe. The OK2SAY program is a 24-hour-a-day hotline that gives students a safe and confidential way to report suspicious or threatening behavior. It has done a fantastic job in helping protect students and save lives. OK2SAY enables students to report tips by phone, text message, and email, and through a website or an app. In 2017, the program received 4,605 tips, an increase of 37 percent from 2016. In real time, OK2SAY connects tip providers to the state police, who assess the situation and then refer the information to the appropriate school officials or law enforcement. However, sometimes threats to students’ safety occur outside of school hours. My legislation would ensure that at least one school official is available to receive information about threats at any time so he or she can take any necessary action to prevent a tragedy. Senate Bill 991 would require, at least twice a year, a governing body of a school to provide the state police with the current emergency contact information for a school official who would receive information submitted through the state school safety hotline — and any accompanying analysis of a potential threat — 24 hours a day, 365 days a year. The school safety package also includes SB 959, my bill to require the development of statewide training standards for active-violence situations in schools. Training and preparation can save lives. When it comes to protecting our schools, it is critical that students, school staff and law enforcement all know what to do to prevent a tragedy and how to respond if a situation occurs. These legislative reforms are on top of $58 million in the budget for school safety initiatives, such as improving access to mental health programs, enhancing OK2SAY awareness and securing our schools. As we have every year I have been in the Legislature, we completed a balanced budget ahead of schedule — allowing local governments and schools to set their budgets using real numbers. This budget continues to make smart investments in the top priorities facing Michigan families and businesses while still enabling us to live within our means. Every school will see increased funding in this budget — with most schools receiving the largest per-pupil increase in 17 years — and we are putting an additional $330 million into fixing our roads and bridges. To ensure that Michigan schools are safe places for kids to learn, we are investing $58 million for our schools and communities to make the necessary safety improvements to protect our students. Last year, a group of local education leaders and my office studied ways to improve partnerships between area schools and Jackson College and Monroe Community College to reduce the need for remedial education. This budget builds on that collaboration and includes $25,000 to continue that work. The entire state budget features $6 million to support rural hospitals, a $9.25 million boost for local public health departments, a $22.5 million increase in local revenue sharing, $40.9 million for skilled trades training and $100 million to fully fund the Marshall Plan for Talent. This budget makes wise investments to meet our challenges, educate our children, provide essential services, and attract tourists and job creators to Michigan. Another local project we were able to include is an additional $45,000 to help Lenawee County farmers maintain filter strips that prevent phosphorous from flowing into Lake Erie. LANSING, Mich. — The Michigan Legislature on Tuesday finalized Sen. Dale Zorn’s legislation to honor Michigan State Police Trooper Calvin Jones, who was killed when his patrol car crashed during a pursuit on Feb. 10, 1956 on M-52 south of Adrian. The bill received unanimous support in both the House and Senate and now heads to the governor to be signed. Jones’ daughter, Patricia Rowley, and her husband Claude Rowley attended a Senate Transportation Committee meeting in February in support of the bill. Lenawee County Commissioner Jim Driskill knew Trooper Jones, who was a close friend of his father, and testified in support of Zorn’s bill. 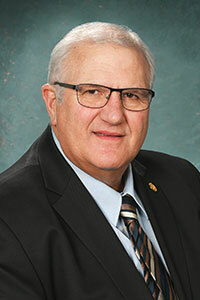 LANSING, Mich. — Sen. Dale Zorn has announced that he will conduct district coffee hours this month in Tecumseh on June 18 and in Maybee on June 25. The first coffee hour will be held Monday, June 18 from 8:30 to 9:30 a.m. at City Limits Diner and Pancake House, 114 W. Logan St. in Tecumseh. The second coffee hour will be held on Monday, June 25 from 8:30 to 9:30 a.m. at the new Maybee Village Hall, 9051 Raisin St. in Maybee. LANSING, Mich. — Sen. Dale Zorn has announced that he and Maj. Gen. Michael A. Stone of the Michigan Army National Guard will attend a public meeting on June 14 to discuss the recently announced super armory project in Dundee and why the site was selected. A public reception highlighting the acquisition of 44 acres of land in Dundee for a new Michigan National Guard super armory. Thursday, June 14 at 6 p.m. If you plan on attending the event, please RSVP to Paul Egnatuk at 269-209-3867. LANSING, Mich. — Sen. Dale Zorn on Tuesday supported a finalized fiscal year 2019 state budget that increases investments in key priorities, including educating Michigan students and improving the roads. “As we have every year I have been in the Legislature, we completed a balanced budget ahead of schedule — allowing local governments and schools to set their budgets using real numbers,” said Zorn, R-Ida. “This budget continues to make smart investments in the top priorities facing Michigan families and businesses while still living within our means. The entire state budget plan features $6 million to support rural hospitals, a $9.25 million boost for local public health departments, a $22.5 million increase in local revenue sharing, $40.9 million for skilled trades training and $100 million to fully fund the Marshall Plan for Talent.